I get lots of questions about just how dry does the FAB Dock keep my boat. I could go on and on about the months we spent designing and testing and prototyping numerous ideas and models before we arrived at the perfect solution, or I could show you in a simple picture. 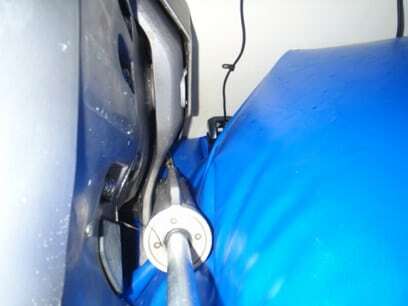 This is the transom of our boat showing the leg and tilt ram on the left with the transducer to the right of it. Not a puddle, pool or drop of water to be seen. Our boat, which doesn’t have anti-foul on it, has now been living in various prototype versions of a FAB Dock for over a year and when we pulled it out a few weeks ago, was as clean as the day we put it in.